Iran nuclear deal: When will Tehran get a McDonald's? It was a truly historic agreement - after prolonged talks, Iran and Western powers signed a deal last July that warmed ties between the countries. Six months later, on 16 January 2016, international sanctions on Iran have been lifted. This means money to and from Iran will flow more easily, and that US companies, among others, will see increased opportunities for trade with Tehran. Since the deal was announced, one subject has been getting quite a few Iranians talking on social media - is it now inevitable that one of the most American of brands will arrive in Iran? Well, hang on - not so quick. The sanctions, in place since 2002, have only just been lifted, and the implications of the move are not yet clear. Having said that, a simple search on Twitter of the Iranian term for McDonald's brings up plenty of posts since the deal was agreed last year. Some of the tweets are full of anticipation, some full of despair, some full of sarcasm. There are also signs the chain might be eyeing up a potential Iranian franchise. If you are interested in running a McDonald's franchise in Iran, you can apply to do so. But its international website says: "We have not set a firm date for the development of McDonald's restaurants in Iran," adding that, in the future, they "may take steps to do so". It says the same for all countries where it does not have a franchise. 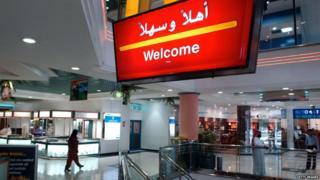 McDonald's did not respond to the BBC when asked if it was looking to open in Iran. Who else gained a McDonalds after relations warmed with the US? And who is still waiting? What does it mean when a country gets a franchise? "To the rest of the world, McDonald's is a little slice of Americana," said John Stanton, a professor of food marketing at Saint Joseph's University in Philadelphia. "When it opened in Moscow, people weren't going for hamburgers, it was for a piece of America. In the US, it is targeted for children. But in the rest of the world, it can represent a certain level of middle-class comfort. "You are now being recognised as having made it." But I thought there already was a McDonald's in Iran? There is a rogue chain of Mash Donald's restaurants in Iran - you will not be surprised to hear that this brand is not endorsed by its US counterpart. Mash Donald's is not alone - there are plenty of other imitation restaurants in Iran, some more convincing than others. In 2012, it was widely reported in Iran that KFC had opened its first official franchise in Iran, in the city of Karaj - but our colleagues with BBC Persian found out that it was unauthorised. At the time the deal was announced, Yum! - the company that owns KFC, Taco Bell and Pizza Hut - said it was not taking applications for any new franchises in the Middle East, but there is now a way to enquire about opening new franchises in the region. It's not known whether the American-owned Mexican grill chain Chipotle plans to open in Iran. Will the West benefit from Iranian food exports too? It's what many import and export companies have been waiting for - and the lifting of sanctions bodes well for them. Last year, the British-Iranian Chamber of Commerce said it had "already seen clients ramp up their marketing efforts in Iran over the last 12 months." Now sanctions are lifted, expect easier access to Iranian pistachios, dates, saffron and herbs. Image caption Iranian pistachios: heading West soon? Among those who stand to benefit is Sally Butcher, the co-owner of Persepolis, an Iranian cafe and shop in south London. "There have been difficulties as a small business, and the sanctions are not aimed at us," she said. "It will be much, much easier now. We can have a much greater range of things we can bring in. It will have a slightly adverse effect as money will buy us a lot less in Iran. "But it is the beginning of a new era."